You get a new job as a prison guard. A tough and dangerous position, but you have a young wife and a baby on the way. Eager to show keenness and perhaps to ease your own nerves, you turn up a day before you’re due to start and get a guided tour of the prison. You’re warned of the special cases, the most dangerous murderers, even as your guide grumbles about under-funding and the fact the building is crumbling. As if to prove his point, a lump of plaster falls from the ceiling and brains you. When you wake up, a prison riot is in full-swing. This is the premise of the new Spanish thriller directed by Daniel Monzón, who has hitherto not had much of a profile on the international market, but who might be on to a winner here. Alberto Ammann plays Juan Olivier, the luckless new guard who has to pass as a prisoner if he is going to survive the riot. The shaven-headed Malamadre is the chief badass, played by Luis Tosar (with a voice so gravelly it makes Tom Waits sound like Aled Jones circa 1983), with whom Olivier enters into an uneasy friendship. Malamadre is a commanding presence even in the company of the various heavies of the prison population, a hard man of cunning intelligence and instant charisma. Olivier himself is no Bruce Willis or Steve Segal. It is not revealed that he has actually had special training in the black ops secret delta shadow government kill squad but was kicked out for being such a maverick. Instead, he’s just an ordinary Joe - like us, is the point - and his sudden improvisations are convincingly panic-stricken, and yet sometimes inspired. Our protagonist’s ordinariness is also demonstrated in how he changes throughout his ordeal, his own sympathies and allegiances shifting with shifting circumstances. In its self-contained cleverness, the plot could easily be a bottle episode of a long-running cop show, or perhaps something from Oz. In fact, it’s quite possible we’ve seen it somewhere before, in one form or another - perhaps even in an episode of Starsky and Hutch. For all that, though, it is handled here with great skill, and the concept of ‘the tension mounts’ seems invented for this film. There are moments at which it's difficult not to bite your knuckle or implore aloud for Olivier to do this and not that. The presence of Basque terrorists raises the stakes of the riot to a national level, and has resonated in Spain, where the film was a critical and commercial triumph. It has some things to say about the Spanish prison system and displays a witheringly cynical view of the authorities at pretty much every level. 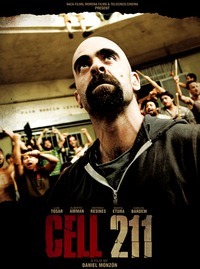 This isn’t quite a prison drama on the scale of A Prophet, made and released domestically in the same year (2009), and against which this film would struggle to be compared. Whereas Audiard’s film soon broke away from its prison roots, looking beyond the wall to become a grander gangster epic, Cell 211 confines its focus to its claustrophobic setting and almost real-time chronology. But with uniformly excellent performances, tight direction, and a grim tone established immediately in the first few minutes, what could have easily turned out as a routine generic exercise becomes extremely effective. This review was published on July 17, 2011.